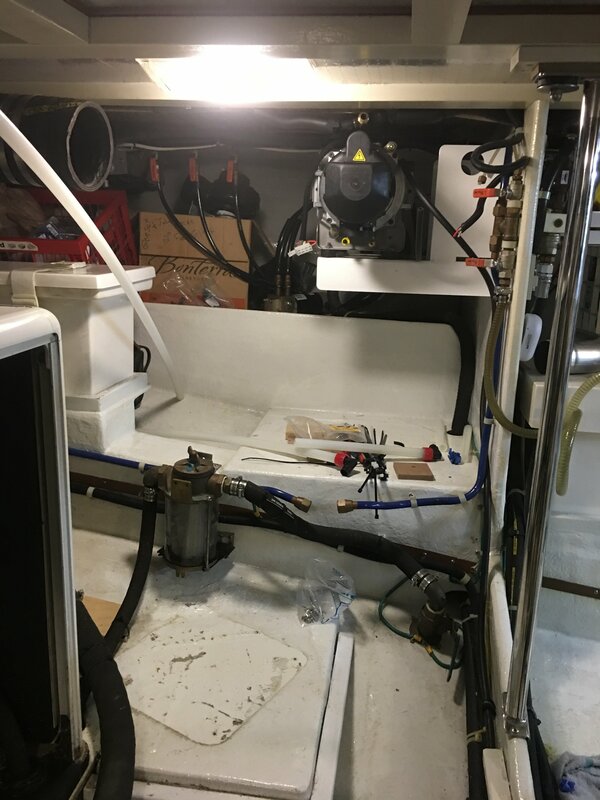 The diesel heater install aboard Idyll Time is progressing smoothly, so we decide to head out in the RV to explore areas of Vancouver Island that we won’t be visiting by boat. 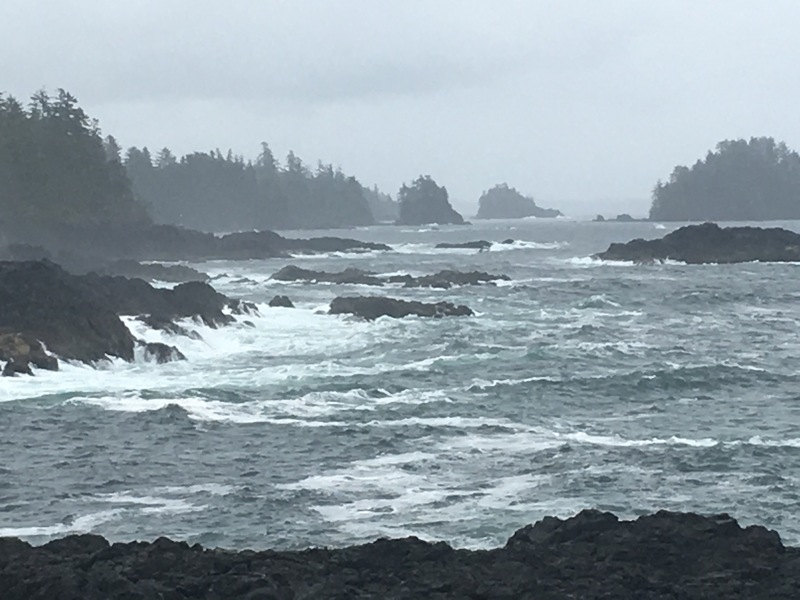 We have had numerous friends suggest Tofino and Uculet located on the west coast side of Vancouver Island as “must see” places. The Pacific Rim National Park is conveniently located between these two towns so that is our destination. Perched on Long Beach, the park is very popular and the camping spots are booked many months in advance. After checking their website daily, we finally lucked out and were able to snag three nights at a camp site that someone had canceled. 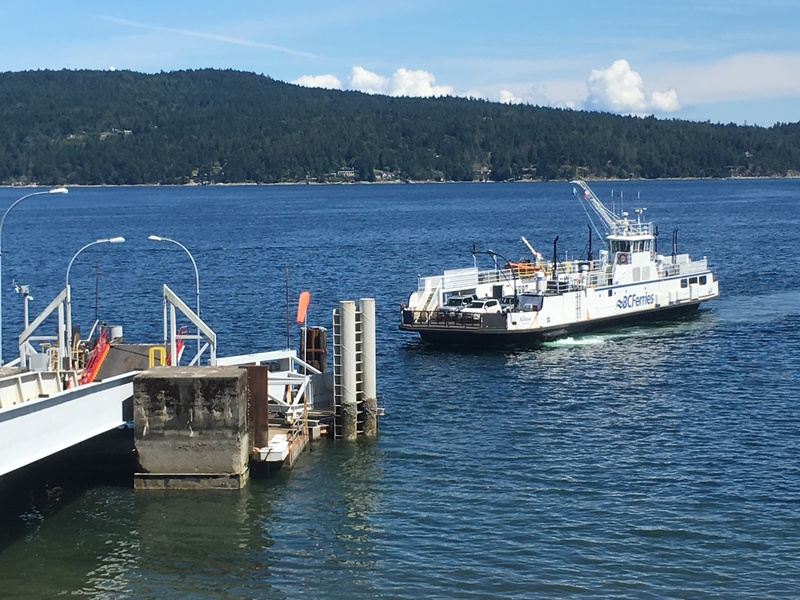 Instead of traveling south to Victoria and then north, we decided to take the Mill Bay ferry which cuts out about 30 miles of travel. It is a short and scenic ferry ride of 25 minutes across the bay. 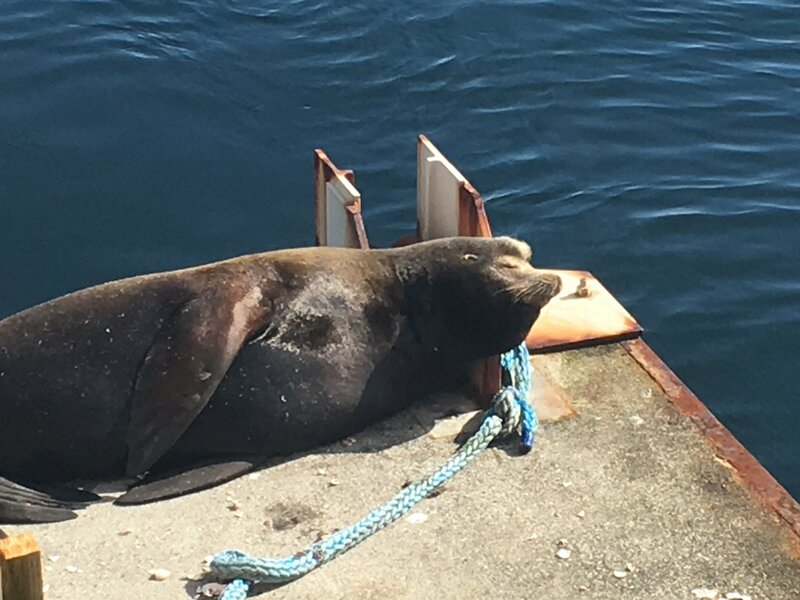 Reaching the other side , we were rewarded with our first sighting of a fat harbor seal hauled out on the ferry landing dock. He took little interest in our arrival. As we drove off the ferry, he was back sound asleep. 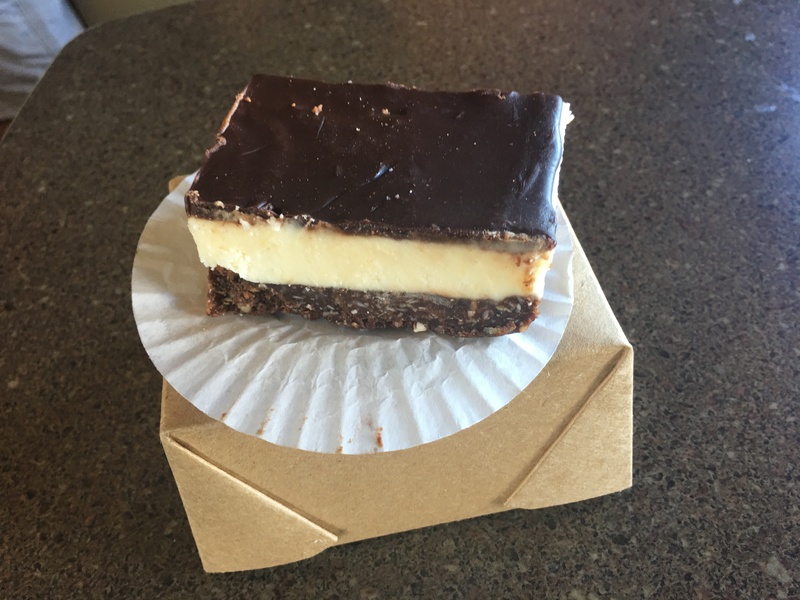 A stop was made in Nanaimo at the local bakery to try their famous Nanaimo Bar. The origin of these desert bars supposedly dates back to the the 1930’s. There are different variations of these bars but basically they are a no bake bar with a crumb layer topped by a custard layer and then covered with melted chocolate. Legend has it that local fishermen would take these bars out to sea with them as they required no refrigeration. We first discovered these bars at the local bakery in Sidney. Our mission is to find the best Nanaimo bar on Vancouver Island. Since they originated in Nanaimo, this seems like a good place to start. We will let you know our findings. Our other reason for stopping in Nanaimo was to check out the Too Birdie Hotel. We are so thankful to find this Parrot rescue and boarding facility. One of our concerns has been what we would do with Nate and Primo if we had to fly back to the U. S. There is no way we could go through all the hassles of getting them across the boarders more than once a year. 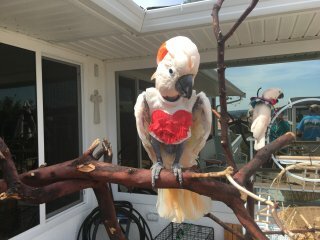 Dianna, the owner, has opened up her home for the care of parrots. Her home is filled with cages of all sizes both indoor and outdoors with both rescue birds and others that are just visiting. She must have 30 birds here now. It is total chaos. Dianna even makes a homemade birdie bread with healthy ingredients for the birds. Each day she lets the birds spend some time in the outdoor flight cage. After a tour of her facilities, we think Nate and Primo would enjoy staying here. They may not want to leave. The only way across the rugged mountains to the Pacific Ocean side of Vancouver Island is Highway 4. This narrow vertiginous road takes us up and around the snow capped mountain peaks. It is a stunning 60 mile drive through the mountains and heavily wooded forrest. 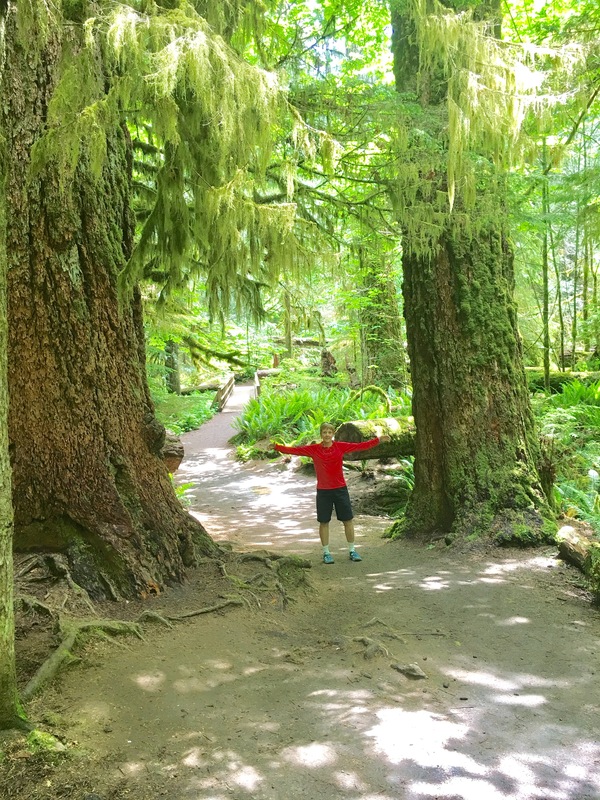 We make a tourist stop at Cathedral Grove to visit an old growth Forrest of both cedar and fir trees. 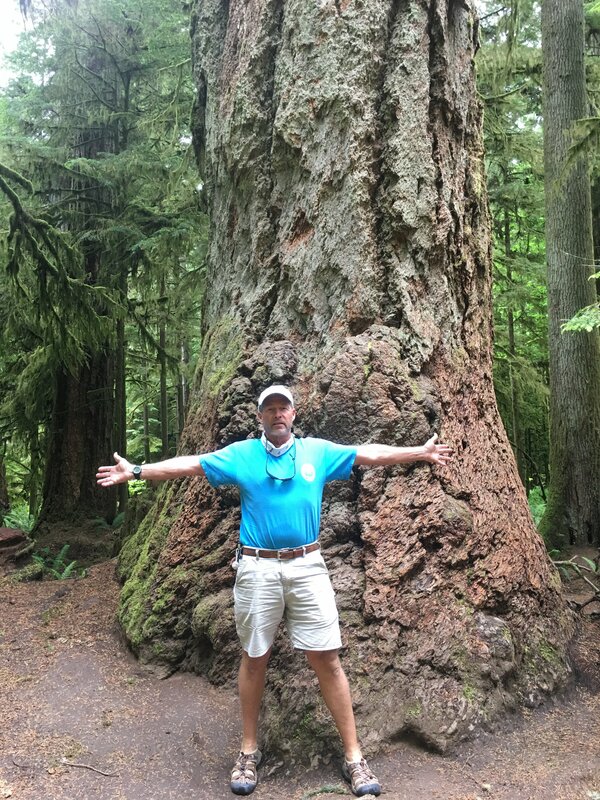 Some of these trees are estimated to be over 800 years old. This area was spared from extensive logging that has taken place in British Columbia for many years and is now a provincial park. 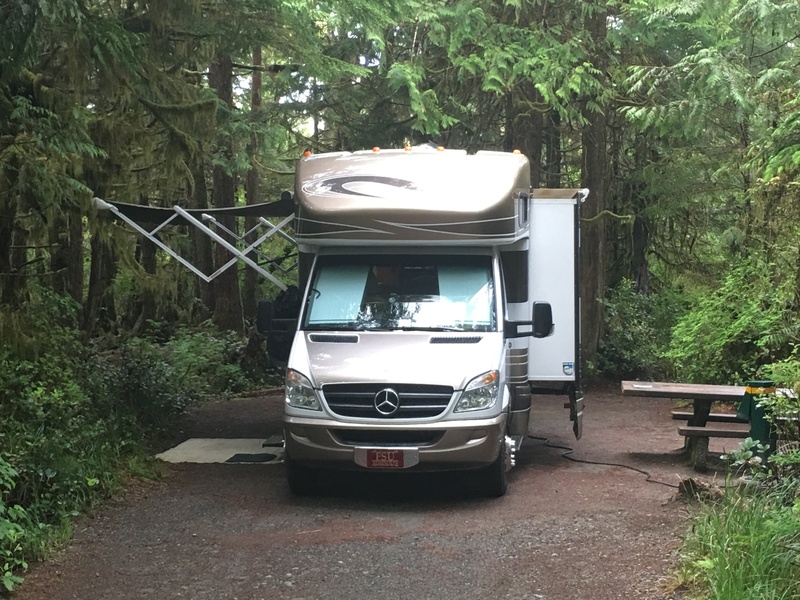 Our home for the next few days is the Pacific Rim National Park. Checking in, we learn that there is a wolf safety warning for the area. The ranger said a wolf snatched a small dog while being walked on a leash here several weeks ago. The campground is on a bluff overlook Long Beach. We have a great campsite nestled in the forrest. A short hike brings us to Long Beach at low tide. Tides here are 13+ feet so we are rewarded with a expansive beach with hard packed sand. There are several surfers out in the cold Pacific Ocean water today. 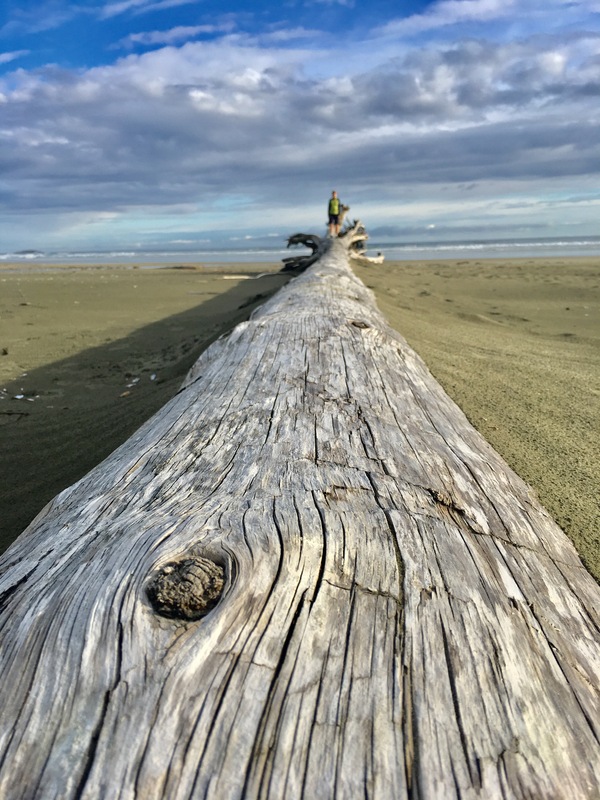 It is amazing to see the huge assemblage of logs that have been washed ashore here. The weather doesn’t cooperate and we have rain all weekend long. This doesn’t deter us from exploring the area. Our first stop is a two mile hike through the rainforest. 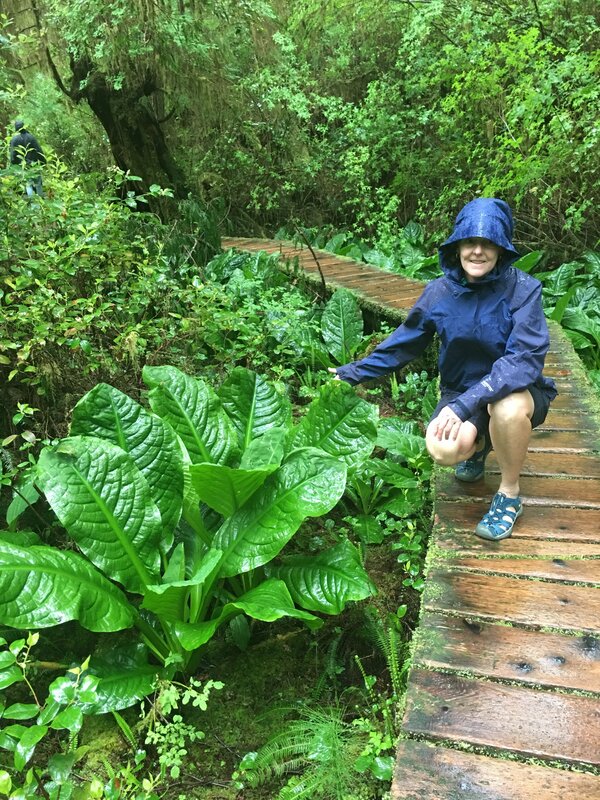 We figure what is more appropriate than hiking in the rain in a rainforest. Some of the plants and trees are humongous. Photos don’t capture the true grandeur of this eco system. Tofino is our next stop. Being perched on the edge of the Pacific, it attracts two types of visitors, tourists for whale watching and surfers for the big waves. It is a small town with one one main street housing surf shops, tourists boutiques, and restaurants. 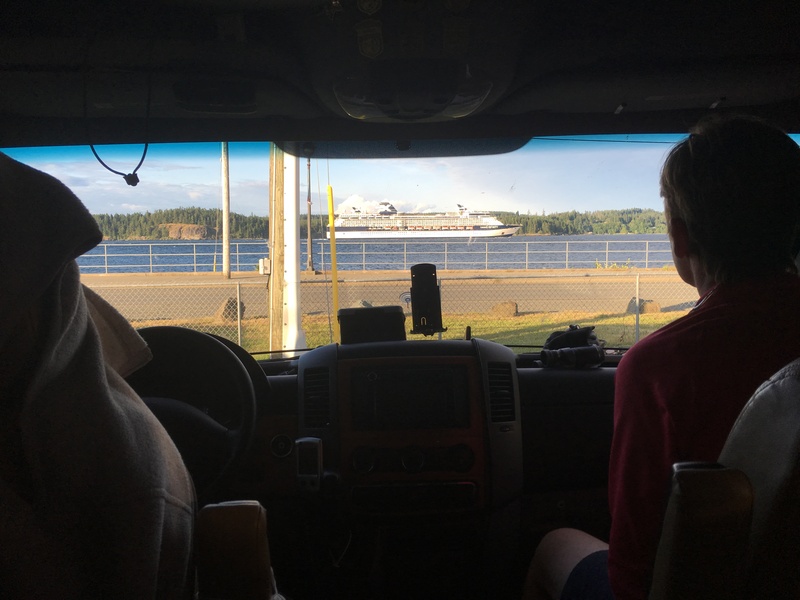 A steep downhill leads us to the town dock where we watch the numerous sea planes come and go. There are quite a few fishing boats in the harbor but no private pleasure boats. It would be great to bring Idyll Time here someday but the weather and waves can be a huge challenge on this side of the island. Circumnavigation of Vancouver Island is a big deal up here. Maybe in a few years we will have enough confidence to tackle this one? Before leaving Tofino, we make a stop at the local bakery. 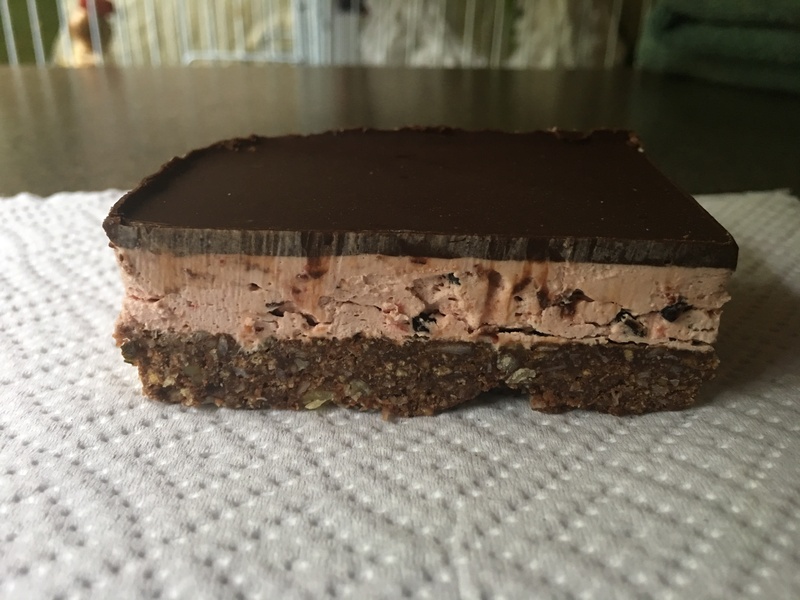 Tofino has their own version of the Nanaimo bar known as the Tofino bar. Their bar has nuts embedded in the cookie layer and everyone within ear shot feels their bar is superior to the Nanaimo bar. Rivalry between towns is proud and fierce. Heading 20 miles south, we arrive in the small village of Uculet. It is quite a bit smaller than Tofino but I think more picturesque. 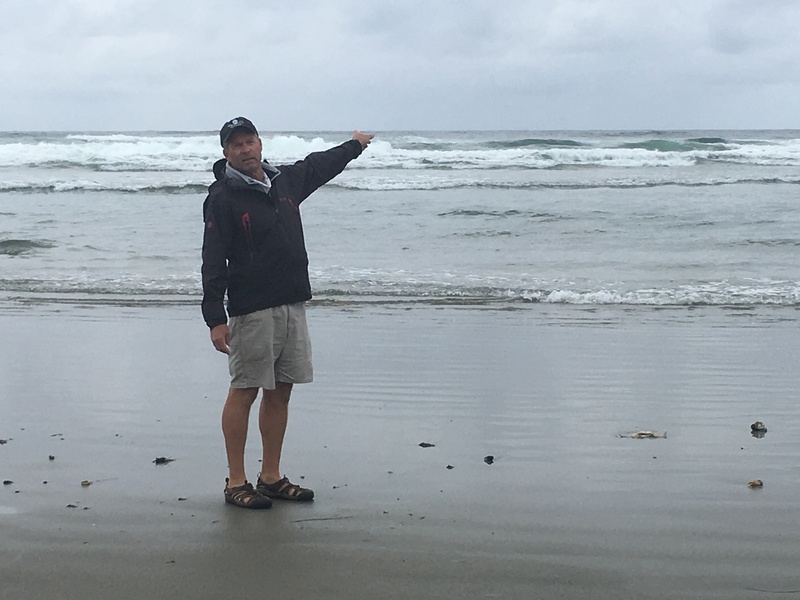 The Wild Pacific trail makes a loop along the rocky Pacific shoreline through the town. In the winter people come here to watch the high surf that the winter storms bring. Uculet has a very small aquarium perched on the Wharf. It is pleasantly informative and the small tanks are well maintained. Everything in here is catch and release. Their big excitement is the Giant Pacific Octopus that is getting ready to be returned to the Ocean. Of course we can’t leave Uculet without finding the local bakery. Low and behold here we discover the Uculet bar. This version has a raspberry cream filling with a dark chocolate top. After retracing our steps on Highway 4, we decide to head north to Campbell River. 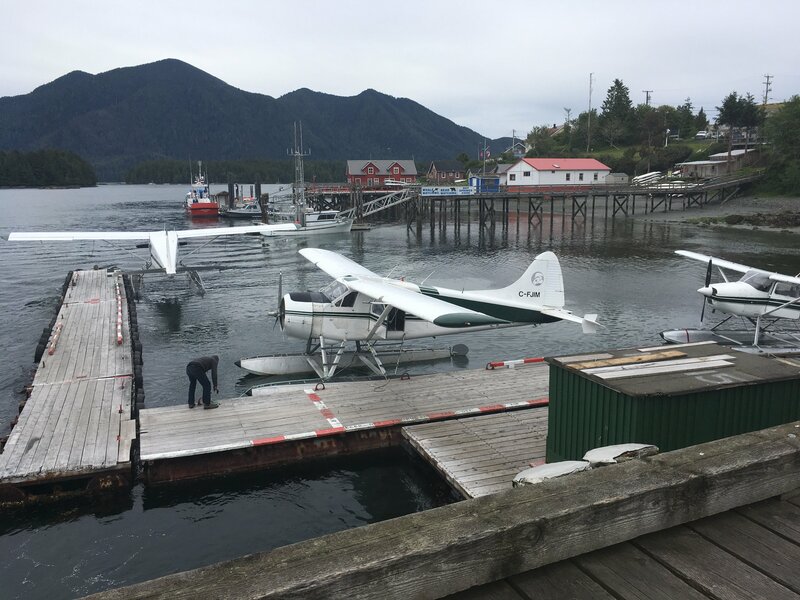 This fishing town is located along the banks of Johnston Strait on the eastern side of Vancouver Island and is known as the salmon capital. Our campsite is feet from the waterway. Transiting this strait will be one of our challenges this year. The narrowest section, know as Seymore Narrows, can only be transited at slack tide. Any other time has currents up to 15 knots and whirlpools larger than our boat. Even the largest of cruise ships wait for slack current. This is the route most cruise ships take on their inside passage to Alaska. We see two cruise ships coming down today. We are nervously looking forward to our opportunity for transiting this passage later this year. Campbell River is a busy town with three big marinas and regular float plane service to the out islands. While exploring town, we stumbled upon a First Nation graveyard along the waterway. 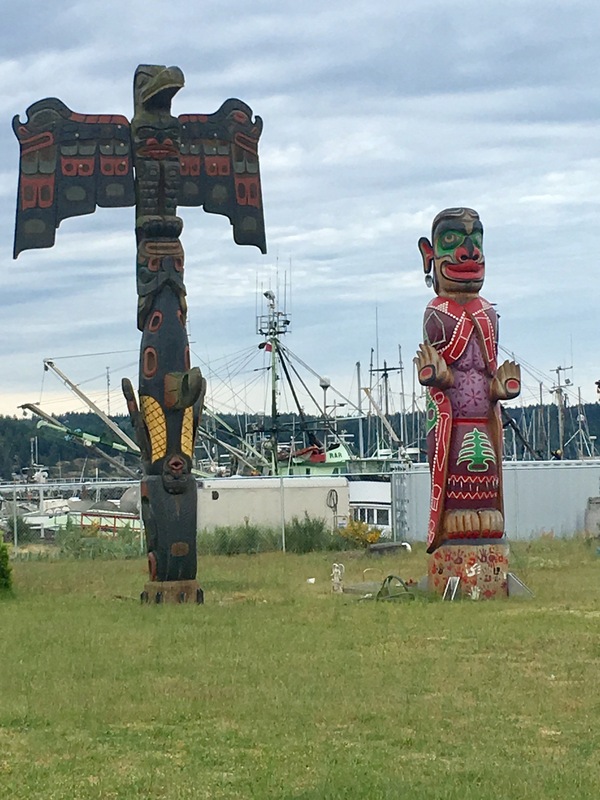 It is quite interesting with its many totem poles and other wood carvings. We did not find the local bakery but plan on stopping here once underway in Idyll Time and will continue the Nanaimo bar quest. Time to returned to Sidney now to check on the diesel heater installation. We should be cruising soon. So, who has the best Nanaimo Bar so far? 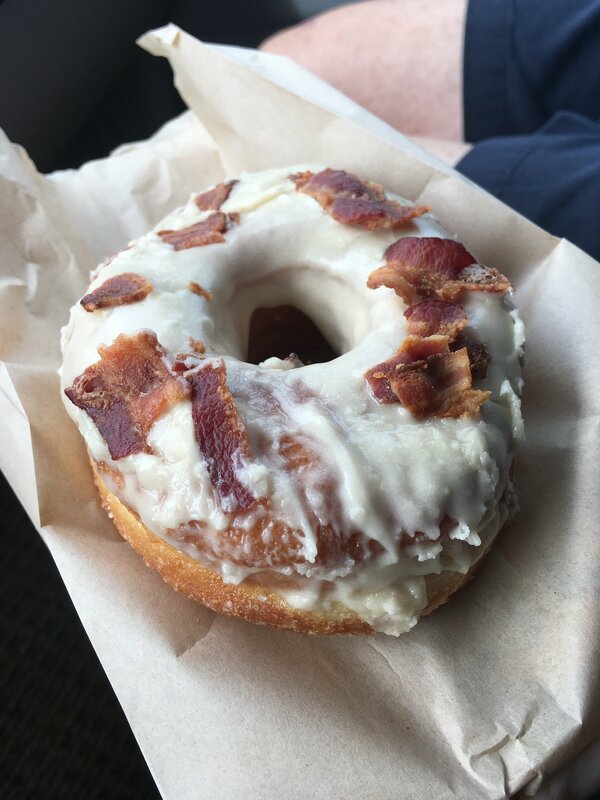 The search continues but as of now the critics choice has been momentarily diverted by the discovery of a homemade maple bacon donut. Eh? This entry was posted on June 22, 2017 at 2:57 am. You can follow any responses to this entry through the RSS 2.0 feed. You can leave a response, or trackback from your own site. 1 Response to "Pacific Rim National Park"
Wow looks like Jeff is in heaven with the chocolate bars and my favorite, the maple bacon doughnut! Unfortunately the princes does not approve ???? Have fun and looking forward to more adventures.